How crazy has this season been? FIU is playing for their 7th win, in their 9th game of the season! However, this has all the symptoms of your classic trap game. The Panthers are coming off the high of their big homecoming win over the UTSA Roadrunners, and are facing an Old Dominion squad coming in with a 3-6 record. Five of those losses came at the hands of teams with winning records, so maybe the Monarchs just had a tough schedule. It’s easy to look ahead at the Shula Bowl rivalry game and expect to just win this week, but in college sports, you can’t play a more dangerous game. This one was a roller coaster from beginning to end. The Panthers came out strong and took the early 7-0 lead, but were immediately caught off guard when the Monarchs answered back in the very next drive to tie it up. From that moment on, FIU was asleep at the wheel, but the kind of sleep where you wake up and swerve back into your lane. Old Dominion established the run, and FIU couldn’t stop it. The Monarchs would take the lead 7-14, and it’s looking like the trap game is creeping up on the Panthers. Then, the Panthers felt those road bumps that remind you you’re no longer in your own lane, and about to hit the median. They woke up, swerved back, and would tie the game again. At this point you’re waiting for FIU to take charge and control of the game, but by the end of the half, ODU had taken a 24-14 lead. The second half came with a second wind. The Panthers would once again, score first; bringing down ODU’s lead to three points, 24-21. They would follow that up with a safety to bring the lead down to one point! The stadium was thumping! Actually, no it wasn’t, and that’s unfortunate because the team really could’ve used their fans at this game. I’m sure most people were preoccupied with the other game on the other side of town, but this FIU Panthers team is really on their way to something special. Why not partake in something great instead of jumping on a familiar bandwagon? At this point in the game, a loud fan-base is the type of energy that can propel a team to push that extra inch. ODU’s fans travel a decent amount of people, and they were louder when they needed to be. Shame on you FIU fans that switched allegiances! Not cool, bruh… If you weren’t there, you missed an amazing game that had potential to go down in FIU lore. The Monarchs scored 13 unanswered points, putting them up 14 points with 1:32 left in the game. Nail in the coffin, right? McGough says no way, Jose! 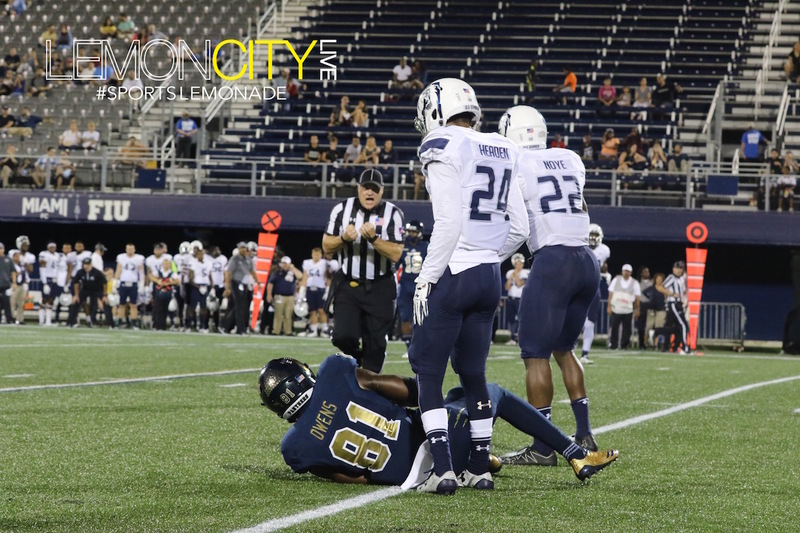 (Borregales) FIU took the ball 61 yards in 7 plays for the TD on an 11-yard pass to Tony Gaiter. The Panthers now needed an onside kick, down 30-37. Obviously, I wouldn’t have mentioned it if they didn’t convert it. Can you imagine how crazy that stadium would’ve been if FIU fans had shown up? Pandemonium! Shout out to the fans that were there, and made it sound somewhat exciting to be there. With 15 seconds left, FIU had a shot to do the unthinkable. On the final play of the game, QB Alex McGough scrambles away from pressure and unleashed one of the more beautiful Hail Mary’s I’ve ever seen. The ball dropped perfectly into the end zone for a chance to be caught by one of the hometown hero’s, but alas, it wasn’t meant to be. It bounced around, but was ultimately knocked down. After the game, at the press conference, the look on the faces of the FIU players was nothing short of sheer determination. They hated that feeling, and they never wanted to feel that way again. FIU take on FAU next, away at the home of the Owls. FAU uses the run game, which FIU has struggled against, better than any opponent FIU has faced this season, but I’ll go out on a limb and say that The Panthers will be more focused and prepared than they’ve been all season. I expect a hard fought game that’ll be decided by the turnovers. No chains, just gains.